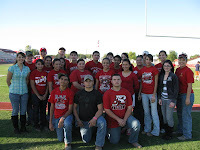 The Rio Grande City High School Future Farmers of America (FFA) celebrated National FFA Week February 19-26, 2011. Infinite Potential was the theme this year and it embodied all the best of the FFA members. The most recognizable symbol of the organization, the blue corduroy jacket that symbolizes pride and tradition, to the bright future of agriculture. Members participated in a week long of activities at the local and state levels in celebration. The focus of National FFA Week is to tell America about the great opportunities that are available for all youth. From its beginnings in 1928 as the Future Farmers of America, the National FFA Organization today reaches out to all 50 states, Puerto Rico and the Virgin Islands. FFA is committed to developing character and leadership skills while preparing members for a lifetime of civic leadership and career success. Rio Grande City FFA members are the leaders of tomorrow. They are well-mannered, perceptive and willing to help others through community service. They are success oriented students who are driven to achieve their goals. FFA gives many young people an important push to consider their futures. The kind of people, citizens and professionals they intend to be. FFA builds leaders, and leaders impact the future.